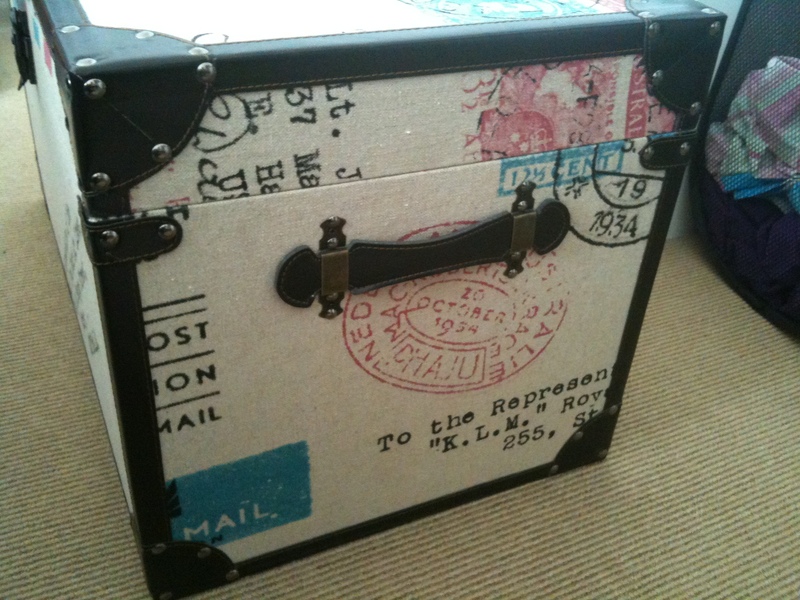 So, this is the nice little (well, its not very little) steamer trunk looking thing I got a couple days ago. There was another one of the same size that was black and white which I liked, but its hinges were rusty. 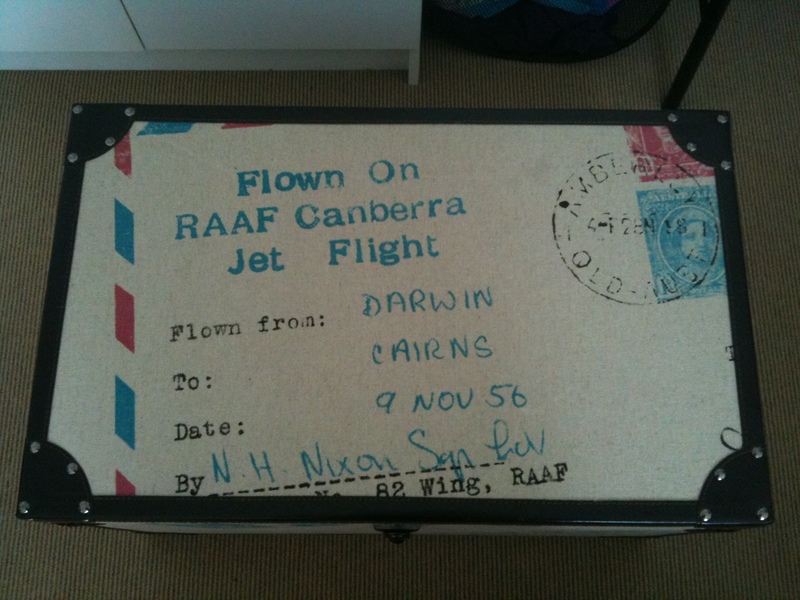 It has cute travel stuff printed all over it, stamps and flight times, postcards and stuff, all Australian locations. I’m calling this one my ‘Glory Box’ because it’s not really the sturdy wooden chest I would like to have, that would be my ‘Hope Chest’. 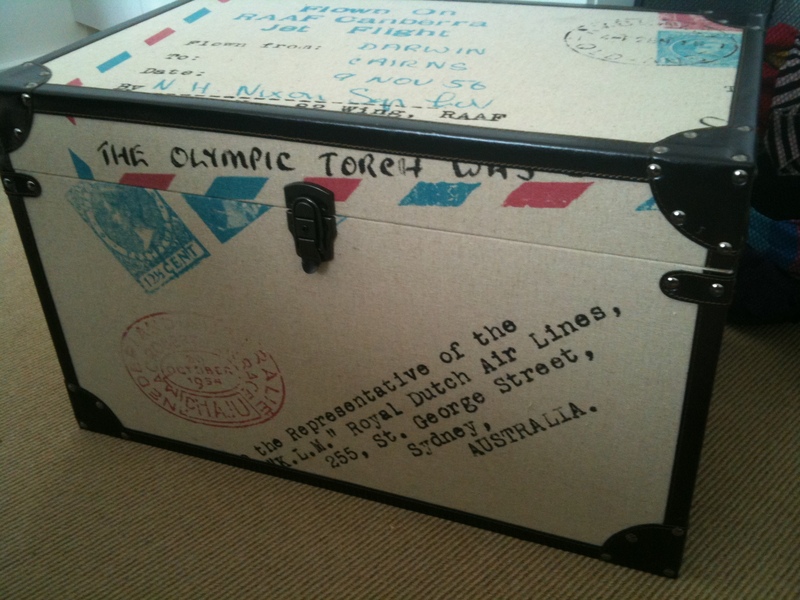 This trunk inspires me to travel, and I think I’d like to keep things like scrapbooks and stuff in there, after its done being filled with blankets and such. So, I decided to put my stuff in there and take some pictures. Starting with my biggest and heaviest item, which is actually a gigantic throw that my Mum knit. 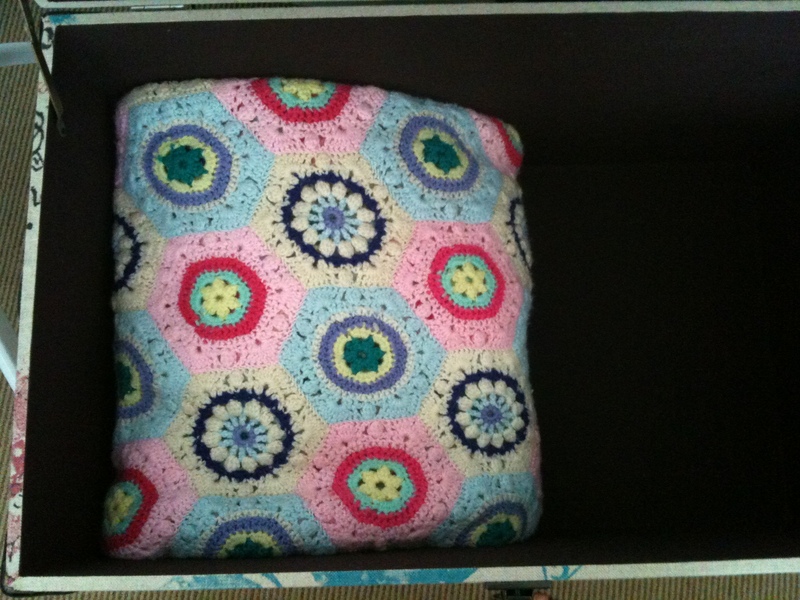 And then my baby blanket, also made by Mum. 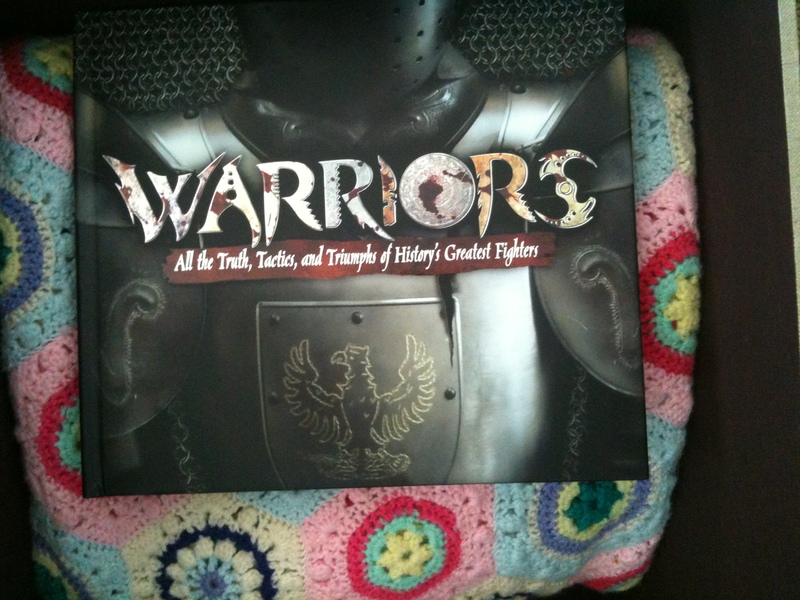 And also the pop-out-ish books that I got. And, finally, the quilt cover set and pillow cases Mum bought me for when I get a big girls bed. I wanted to put the big doona (duvet/continental quilt/whatever) in there too but its in a big square bag that wont fit, and Mum said that it wasn’t practical and that “I would be using the quilt soon anyway”. So thats still on the top of my wardrobe. I don’t have anything else to put in there yet, and probably won’t until I get a job so I can save up for nice things to put in there. My Mums thinking about buying a new dinner set when she has the money – its a pretty floral one – but she doesn’t need the mugs, so I’d probably get those to put away, which would be exciting. 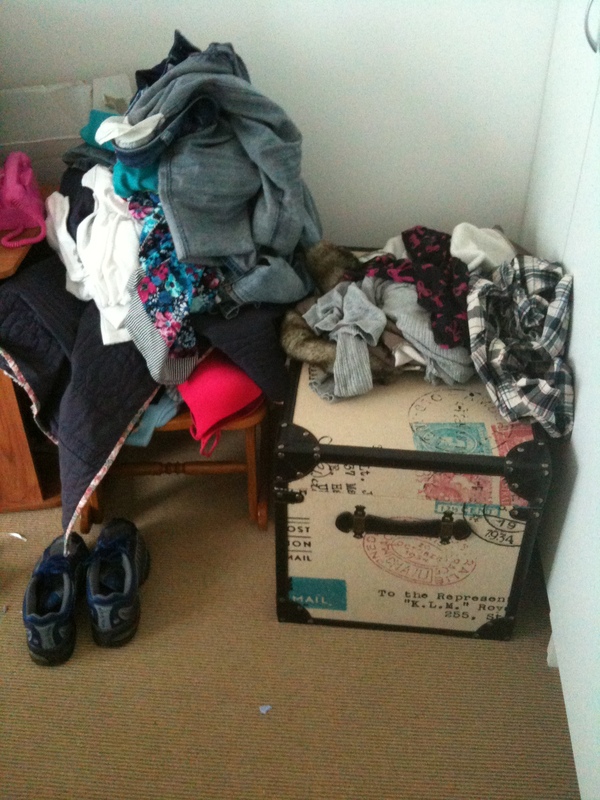 My glory box has gone back into its messy temporary home – yes I need to clean my room, I’ll do that after this, lol. It might fit in one of my wardrobes, which would be good, since ones practically empty except weird bits and bobs at the bottom of it; my light-up pimp cane, my halloween bucket, my slippers, my mums incense box, various birthday bags, and a box filled with stuff previously on my dresser like my Dads elephants and my seashells and fairies. I don’t know where to put any of this. When I get a proper chest (of the wooden variety, I’ve already got the other kind), it might go in the same spot, but without the tiny rocking chair overflowing with clothes, and along the wall facing the centre of the room. It’s a nice idea for it to go at the end of my bed like a blanket box, but then there’d be no room to walk between it and my television. Oh, and these below are the disappointing chests I found yesterday. Darn those spindly legs and cracks in the wood. I was supposed to post yesterday, I know. Everything has been so busy! Sundays were supposed to be my lazy day, and now they’re just not. Dad got the keys to his place, and we’ve been busy helping him move in, and going shopping with him. He’s gradually getting more excited, which is great, because he was being really blah about it before. We’ve been to lots of places – Super A-Mart, Fantastic Furniture (is there a K in there somewhere? ), Ikea. The only place he got REAL furniture from was when we went to Harvey Norman today. Ordered a nice lounge and a bedroom suite, finally! Pretty sure Harvey Norman is the best store ever, and we’re really lucky it was open, because todays a public holiday and we went into the city and EVERYWHERE WAS CLOSED! It was ridiculous, no where that sold any electricals or appliances (only the furniture part of HN was open), not even Woolworths. But in my own town everything was still open – no wonder we get so many visitors down on sundays and holidays. 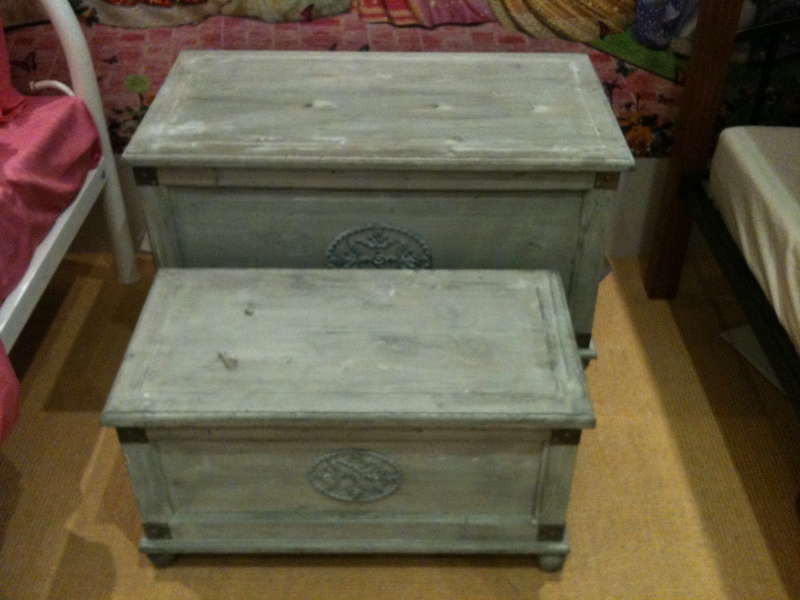 I was a little bit down for a while because in Harvey Norman I saw some chests – not boring blanket boxes, but cute little lime-washed chests with bits of metal on them and they smelt really nice inside, some sort of nice pine. There was a big one and a smaller one and together they were 500 dollars. I had already gotten a 90 dollar steamer trunk-ish yesterday (pics tomorrow maybe). I had like a sudden windfall of chests! Mum said I could have them, and I had claimed them and was guarding them in case anyone else came sniffing around. But then Dad came and had a look, said he didn’t like them, pointed out the spindly legs on the big chest, and then Mum was testing and criticising them, and pointed out some cracks in the wood. It just pissed me off! I mean, it was better not to get them than pay so much for shoddy things, but WHY did they have to be shoddy? How dare the makers of those chests! Even with a discount from a nice employee, it was too much for them. Anyway, I’m sure I can find a nicer chest eventually – or maybe just MAKE one. It’s starting to look like a little house! Although at the moment (until Thursday) his ‘lounge suite’ is three fold out camping chairs. ABOUT the actual house, it’s a nice unit in about 7 others (well, 6 units, 1 big holiday rental at the front), but they have walls and garages separating them nicely, and his is at the back so you actually enter from the street behind. So his is on the street just behind behind the waterfront with some nice take out places, not too far from the bluff, nice area to walk and ride bikes, and it would only take me 10-15 minutes to walk to my friends house! It was obviously made in the 70s, with the yellow and green knit curtains, brown tiles, ‘mustard’ countertops, funny things like narrow cupboards with tea-towel racks in them, dial phone, and until recent changes by the owner it has awful carpet throughout (even in the kitchen!). But I like it, and Mum and I looked through it BEFORE Dad did, and if we didn’t have so much furniture and eventually an extra girl, we might’ve had it. There was definitely something else I was going to talk about but it’s floating away. Maybe it was how tired I am – I slept for 12 hours saturday night, after a not so good day of throwing up on the way to the shops and such. Maybe it was my sisters kitten, which hunts crickets (they’re EVERYWHERE this autumn! never really seen any let alone so many before), flings its poo, claws the lounge, and sleeps in my bed. There was something I thought of as I started typing all this that definitely could’ve taken up another blog post or two… hmm. But I reckon its time to go snuggle on the lounge – if theres room, as my sister always makes a big mess when she ‘cleans’ – because I’ve been doing so much typing, replying to comments and making this (boring?) post. Sky rocketing views – well, for me, anyway. I’ve had this sudden jump in views just since yesterday! I got 37 views yesterday, 28 on my sewing post! Today I have 20 views, 14 being for the sewing post. I also receive a lot of views for my glory box/hope chest posts, but that was like an gradual increase, I don’t recall jumping so quickly, but now in two days my sewing post is almost at the same number of views! All of the views seem to be linking to me somehow from another blog – the only reason I can think why is that it has a small banner in the corner that cycles through random wordpress sites, I’m just surprised so many people clicked on me, or that they even clicked on that banner so much. In conclusion, ARTS AND CRAFTS FOR THE WIN! Oh, and people that link random wordpress sites, although I find that a bit strange and unusual. 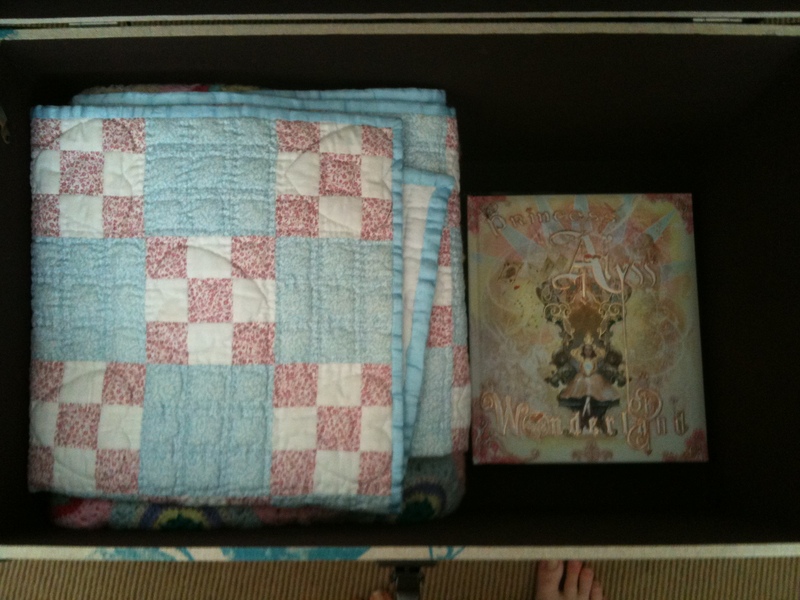 Earlier this year before my 15th birthday, I started planning a glory box – also known as a hope chest (in America I think). My sister was moving out, and I was getting excited thinking about the shopping and planning they got to do, and my Mum noticed – she also noticed I kept stopping and looking at dinner sets, cups, etc. So she suggested I start a glory box. I decided to kinda do it as a homeschooling project – at school the year 10s did an ‘IPP’ I think, which was an individual personal project or something, so its kinda my equivalent. A ‘glory box’, also known as a ‘hope chest’ or ‘cedar chest’, was traditionally a collection of items to serve as a girls dowry for when she got married. Marriages were commonly arranged in exchange for property, business or money from her husband’s family, and the family of the girl would provide all the items required to make a home – and these items would be collected from a young age, and stored in a chest (normally made of cedar to protect the contents within), for easy movability into her new home. Glory boxes (never to be confused with glory holes..) are uncommon in today’s families, except very traditional, often religious and/or homeschooling, homes where the glory box is inherited from mother to daughter. I’ve decided to start a modern glory box for when I move away from home in a few years, instead of for marriage which would be a long way off. My glory box will include some basic kitchen and dining wares, linen, towels, home-made crafts, and anything I may want to keep to pass onto future children. This way, when I start on my own for the first time, I don’t have to worry about it not feeling like a home, or scrounging up money for the basics and extras I need when I’m also trying to pay the bond. And most of the electrical appliances would be gifts from family and friends, so I can just move into a ‘home’ straight away instead of just a ‘house’. 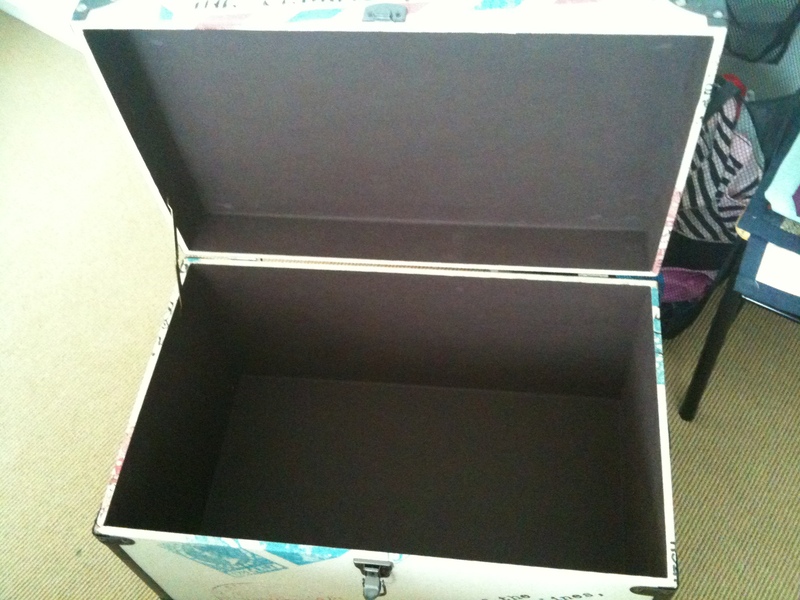 For now I’ll be storing my items in my wardrobe, but I will be getting a chest for my 15th birthday. And if I keep my chest in good condition, I may be able to give it to a daughter I may have when I’m older – which will be a nice family tradition and way of bonding, especially if I have adopted children. I have started a list of glory box items assisted by ideas from Mum and the internet. My Mum and I will be hand making some things for my glory box, such as placemats, Christmas decorations, throws, wall-hangings, and more. Now, unfortunately I don’t have my chest yet. My sister has an old chest with pretty Asian-ish carvings someone gave her, but the hinge is broken, and, well, its old. My sisters friend also has the same or a similar carved chest with a matching coffee table of which I am envious. I’ve also seen another one in my friends house. So I’m really not sure about my mode of storage. Today I’ve been looking at pictures of cute things I’d like to get, or get things that are similarly adorable. I want to have a house filled with cute things, things that make me happy – living alone (or with a roommate) probably isn’t easy and I want to be surrounded with things that make me smile, not things that are boring and plain. Most of these adorable items I love are from modcloth.com – which apart from having beautiful 50-style dresses, has home gifts and various books. I’d love to order some of this stuff, but it can be quite expensive, and the shipping alone would be like over $20 because it’s international. At the moment in my room I have my baby blanket, a massive knitted throw, and my teddy bear quilt (which I use currently), all made by my Mum. 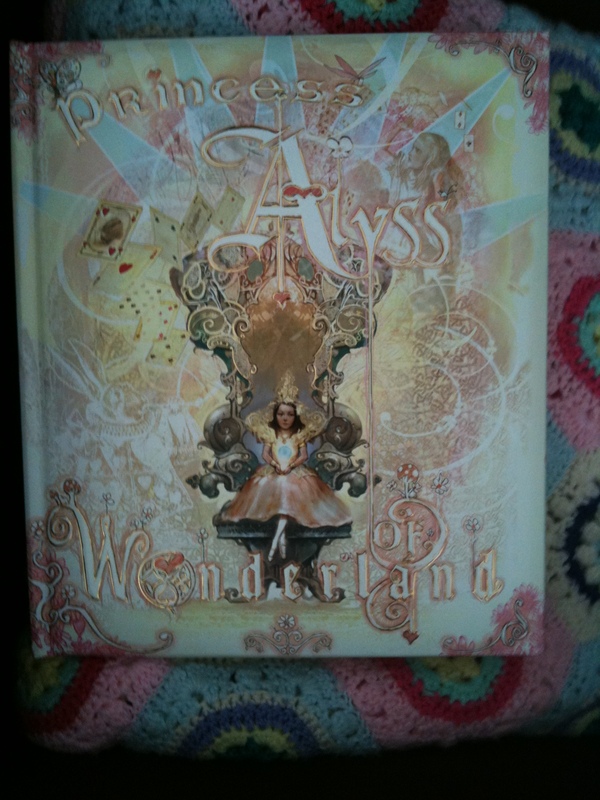 I also kinda caved and bought some pop-up books for my future children >>; one of them is about warriors, and has an illustration where if you pull a tab someone gets disemboweled, and the other one is ‘Alyss Of Wonderland’, which as it turns out is a companion to a book series ‘The Looking Glass Wars’ which I will have to get now, lol. I have the cutest half of my Dad’s old elephant collection (little figurines, not real ones) sitting on my desk going dusty, which I will hopefully preserve for my children. With an accompanying practical plastic folder of recipes, to actually follow as a cook – I wouldn’t want my pretty scrapbook getting dirty. Other things I plan on getting are mugs, glasses, small dinner and cutlery sets, cushions, towels and bathmats, tea towels (which will actually be coloured cloth nappies, like my Mum uses – real ‘tea towels’ are too thin and get soaked! ), a sewing box/basket, a toolbox (pink, ofcourse), maybe a cute little emergency kit (yes, they can be cute, too! 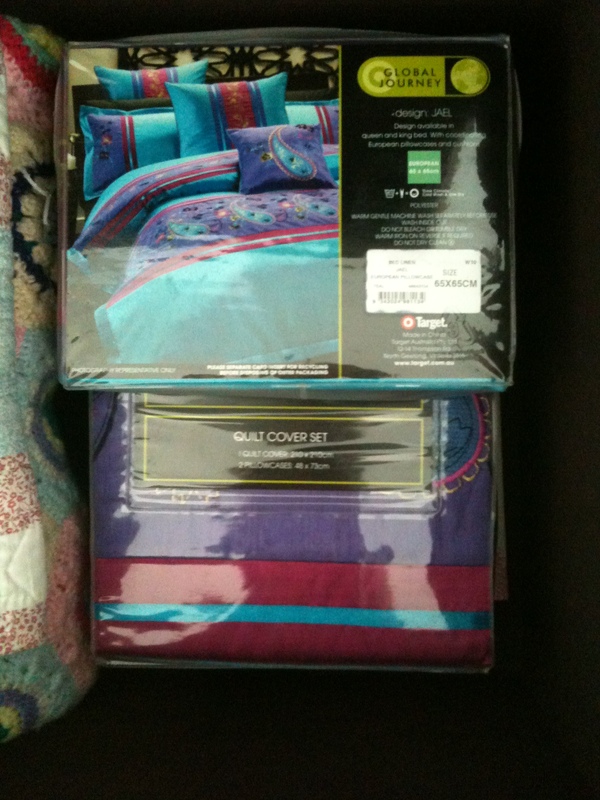 ), some sheets and linens. And these aren’t things I will be actively hunting for, or spending lots of money on. It’s stuff I’d buy because it’s on sale, or because I just see something that I think is really special. Like, mugs are just going to be average, non-expensive things, but I’d like to have a very pretty tea set… although, I should probably start drinking tea O.o; haha. I’d like to look around IKEA – I think they sell Alessi products there, and I wants me a magic bunny to hold me toothpicks! I’ve been reading through an old forum on the australian vogue website about glory boxes. Two things bothered me a little – for starters, all the arguments over feminism… I think feminism is about having a choice, the choice to be a successful woman, to work, and also to be proud of your domestic accomplishments, there is no reason to belittle people that want to make a home. I would call myself a ‘feminist’, but because I believe we are all equal (although different), not because I think men are lesser, or that traditions or domestic things aren’t important. Wearing aprons, baking cookies and popping out babies should be just as much a feminist right as having a career and being independent, because it’s about what I want to do, and I can do it all if I want to. I claim ‘feminist’ as a word of equality and choices, not of man-hating and lesbianism (although the latter is a totally valid choice), just as I claim ‘glory box’ as a term of planning and independence, instead of archaic beliefs and sexism. Oh, geeze, where did all that seriousness come from? I know peoples tastes change, but just because something ‘goes out of fashion’, doesn’t mean you won’t like it any more! Things come in and out of fashion all the time, but I like them all the time – I mean, it’s not like glory boxes are in fashion, but I still want one! I’m not going to buy a bright red set of sheets, or black towels, but that doesn’t mean everything has to be white. In my inspiring pictures, I have a set of plates and bowls that are bright purple with blue and green and brown paisley patterns – by the time I get sick of them, I’ll probably need to buy new ones, or they’ll be good for the childrens table or BBQs….. hopefully. But anyway, I like them. Go colour! Go paisley! Go kittens and pandas and birds! Go horrible decisions that you’ll regret later! BE FREE!! Anyway, I think thats the end of this blog. PLEASE READ, EDIT::: Okay, in this blog I mentioned the stereotype of feminism being man-hating and lesbianism. To note that I didn’t have anything against lesbianism, I put ” and lesbianism (although the latter is a totally valid choice)” but thinking about it almost a month later I realised that is even more offensive than if hadn’t added any clarification at all.